4:28:00 PM If your in the bria Galaxie and you want a dewback I am starting to sell them!SOOOOOOOON! Starting 1/1/2005! I will be selling them for 10k and 15k for a mounted one I will also sell other creatures soon just send me a in game e-mail for a request for one or to know the other creatures and droids and medicenes and I will sell you a pack of white Dewbacks for 50k! Pack=5 of them and 70k for a pack of mounted Dewbacks! 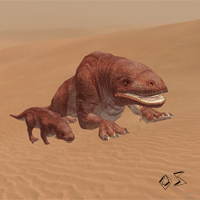 4:07:00 PM The regurlar Dewback is is beter than a lesser dewback with about 4k more Ham that is pretty much beter! 9:03:00 PM A mountain dewback is only 1 lvl higher and is much better then a regular Dewback.